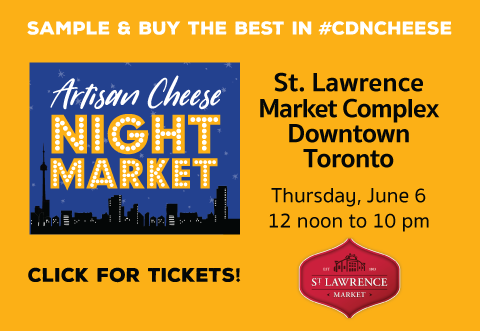 The Great Canadian Cheese Festival is on hiatus in 2018 so we can focus all resources on developing an expanded Canadian Cheese Awards program in Toronto on June 6-7 complete with the first-ever Artisan Cheese Night Market. Click here for information and tickets. Top 12 reasons why you’ll be sure to enjoy the seventh annual Great Canadian Cheese Festival in Picton, Ontario, on June 3-4, 2017—the biggest artisan cheese and specialty foods show in Canada. Sample and purchase 500 foods and beverages, including 150 artisan and farmstead cheeses. 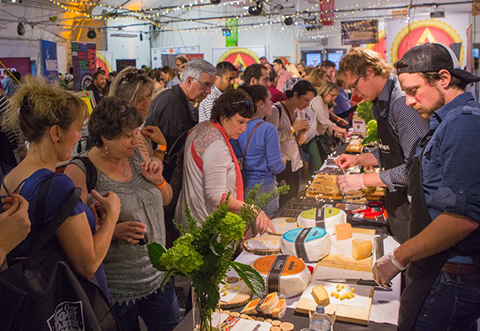 Meet Canada’s outstanding cheesemakers face-to-face, including Québec’s leading producers. Learn at informative cheese seminars presented by Vanessa Simmons of Savvy Company, Canada’s best-known cheese sommelier. Award-Winning Cheese Day on Saturday and Raw-Milk Cheese Appreciation Day on Sunday, with 100+ grams of cheese for the first 1,000 ticket holders on both days. Purchased locaL VQA wines and cider by bottle or case (19+). Access to Food Court, featuring—NEW!— J.K. Fries and braised-beef poutine from Jamie Kennedy Kitchens, outstanding burgers from the new Burger Revolution food truck and smoked-buffalo-meat sandwiches from Ontario Water Buffalo Company. Children 15 and younger admitted FREE when accompanied by an adult. Super Saturday (June 3) OR Super Sunday (June 4): All features listed above. Super Ticket $50 plus tax per day. BEST BUY: Weekend VIP Pass (June 3 AND 4): Admission Saturday and Sunday with VIP access at 10 a.m., one hour before show opens to public. PLUS reserved seating at informative Cheese Seminars. PLUS all features listed above. Weekend VIP Pass $75 plus tax. Tickets can be ordered in advance below or purchased at the door. Children 15 and younger admitted FREE when accompanied by an adult. Special pricing for groups of 10+. Please note some vendors may require token payment for samples, especially adult beverages. Tickets for special attractions such as Quinte Farm to Table Tour and Cooking with Cheese with Cynthia Peters can be ordered below. Click here for tickets to the Jamie Kennedy dinner at his farm celebrating Canadian cheese on Saturday, June 3. No fee charged for ticket purchases online. All ticket sales final. No refunds.